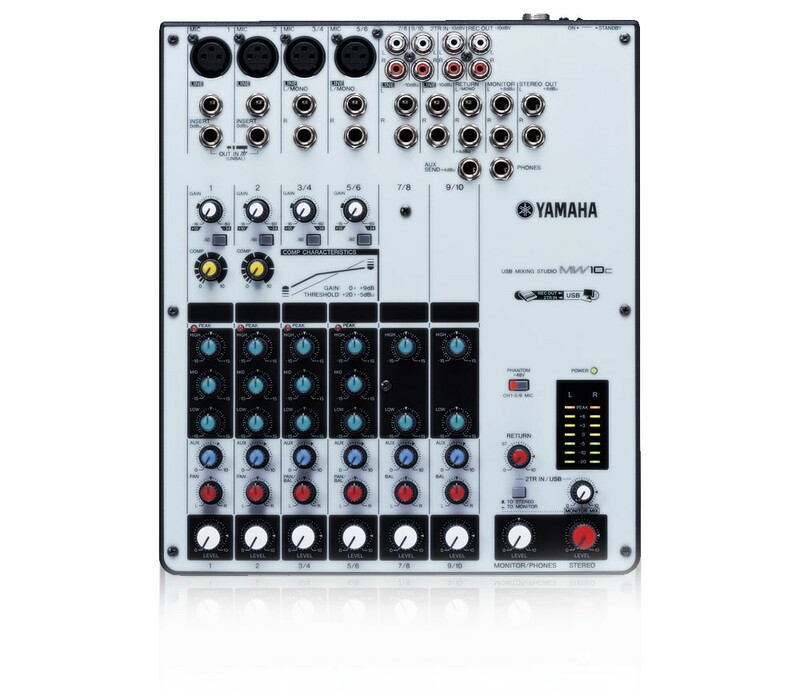 With Yamaha’s MW10C USB Mixing Studio mixers, making great music is easier than ever before. Combined with the powerful Cubase AI audio/MIDI sequencing software, the MW series provides a comprehensive tabletop studio setup for the solo recording musician and for the traveling producer/arranger. Connect the MW to a USB terminal on your laptop or desktop computer, and you’ve got an instant, high-quality audio recording studio at your command. The MW delivers true plug-and-play USB audio input/output interfacing - without the need for special software drivers - and lets you easily record mono inputs or two- track stereo mixes of multiple sources to your computer. Compression - the taming of wildly varying levels in vocals, bass and guitar - is one of the most important effects used in recording and mixing. It is also one of the most subtle and difficult to use. Not with the new MW series mixers, however. The innovative 1-knob analog compressor (on the mono input channels) lets you dial in just the amount of compression you need in recording, without having to set multiple parameters like threshold, ratio and makeup gain. One knob does it all for you - instantly giving you great, punchy sound. -70 dB, STEREO L/R, CH 1-2, PAN panned Hard left or right. Check out the Mixing Section in Alan Parsons' Art & Science Of Sound Recording series. A stream will cost you just 99¢.